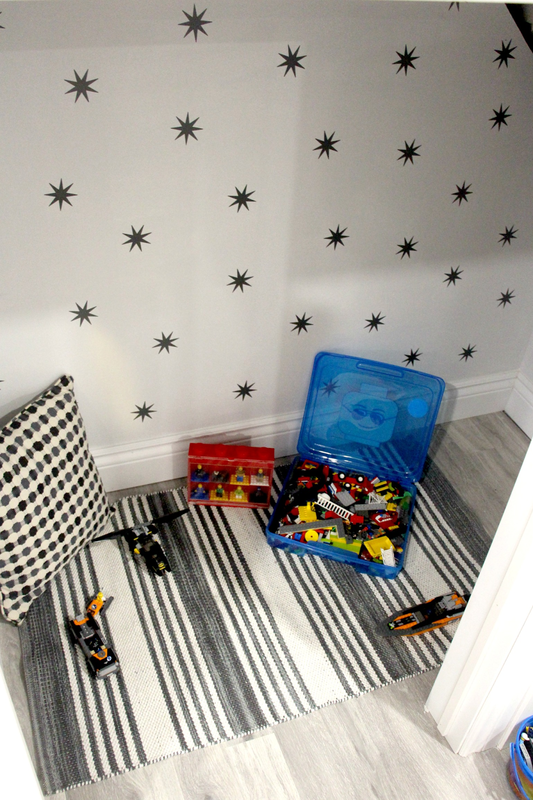 When we were renovating the basement, creating storage spaces was on our list as a must. Old houses often lack storage, guess folks didn’t have much junk to store back then? Or the more likely answer...renovating basements wasn’t a thing, they just used the basement as a cold cellar and to store their stuff. In any event, the space under the stairs was originally planned to store bins. Bins of seasonal clothes, bins of stuff. However, as the renovation came along I knew that cute little space under there would be a perfect little nook for the minis. 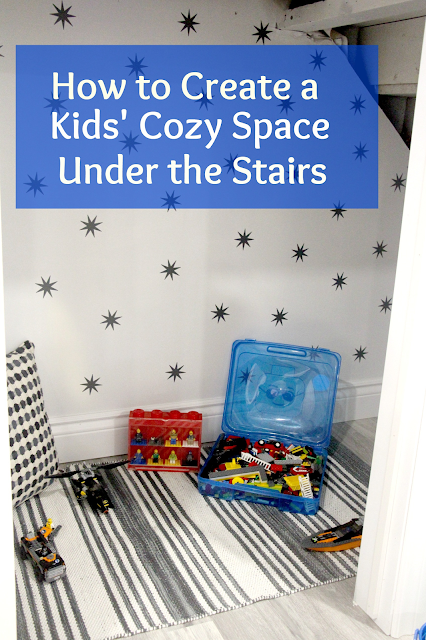 We found space in Mr. Fix-It’s work room for the bins and under the stairs would be saved for them. I shared what I had in mind here. First step was to paint the walls. I used the same colour that we used all over the basement (I had paint leftover in the tin, so why not?). The colour is CIL Tulle White. 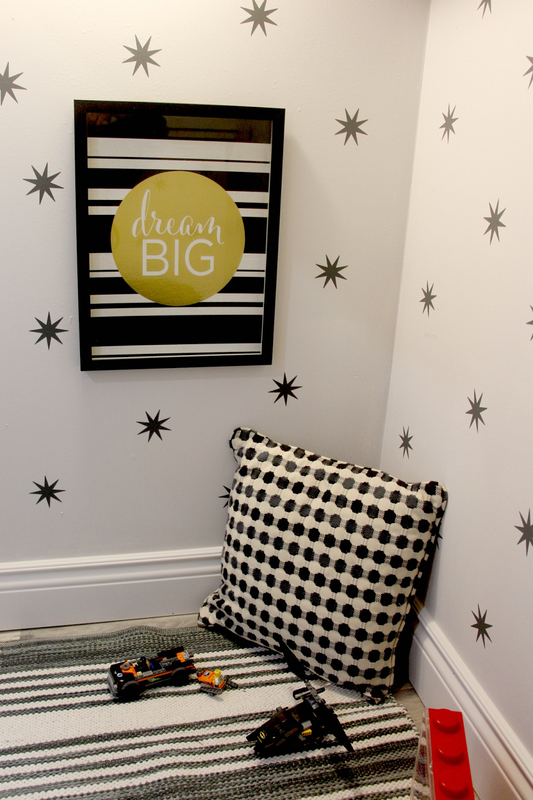 When I saw these mini star decals from WallsNeedLove, I knew they would be the perfect décor to add to this charming space. They were super easy to get up on the wall. 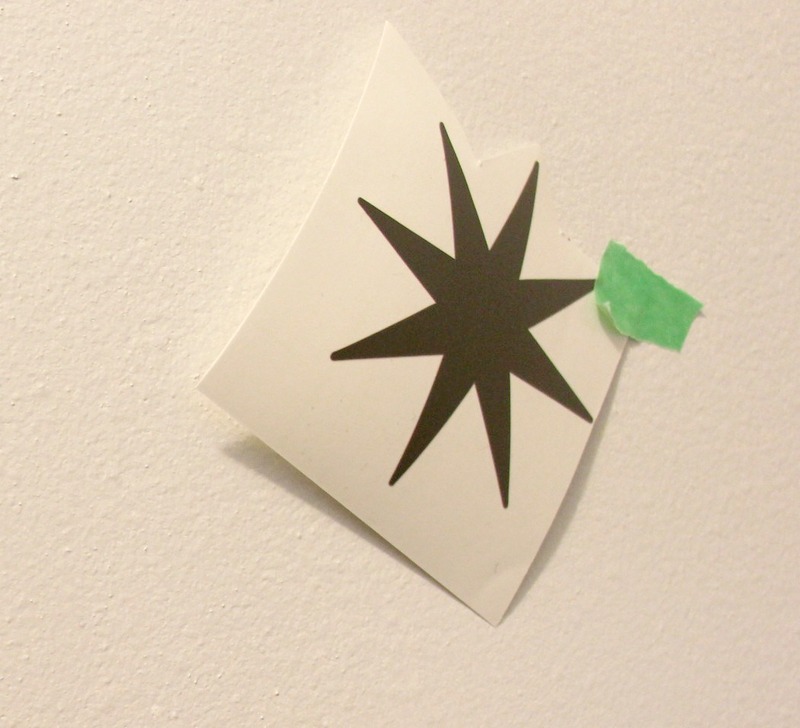 I cut them out and stuck them on the wall with painters tape to get an idea of what the walls would look like. If you are doing the decals randomly than you don’t have to do this. But, I just didn’t want to stick them to the wall and overestimate how many I had, leaving me with not enough. This way I could also move a few around if I didn’t like the spacing. 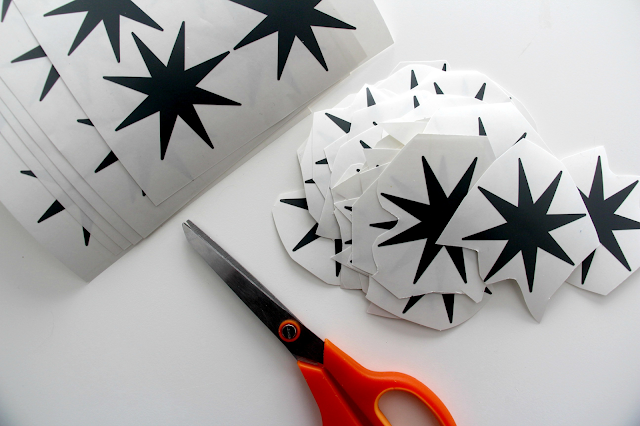 They came off like stickers and because the stars are little, there were zero bubbles when sticking them to the wall. The whole thing took about 45 minutes. Easy, easy. The space looks really cute when you open the mini door. Props to WallsNeedLove. Easy to use product, inexpensive and great impact. 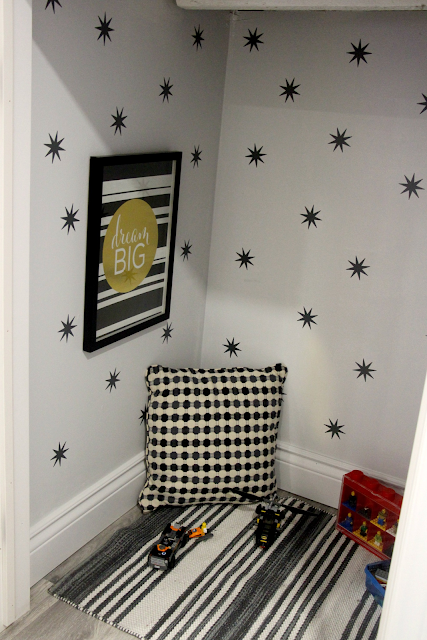 I added the rag rug from Ikea and print to finish it off. 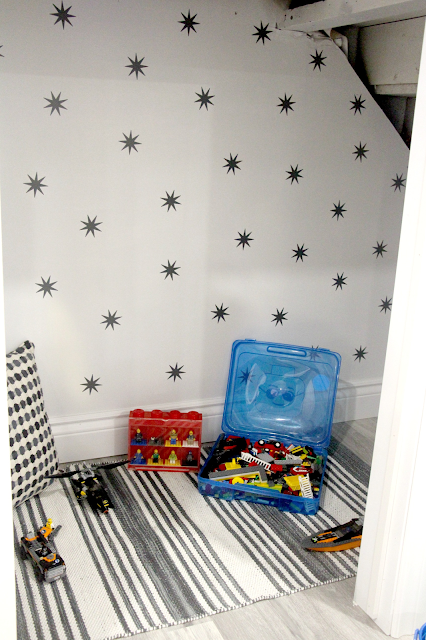 A LEGO nook under the stairs is born. *This post has been sponsored by WallsNeedLove. Their decals are awesome and they even have removable wallpaper which would be the only way I could convince Mr. Fix-It to add wallpaper anywhere J Thanks for supporting the brands that support this blog. This is so much fun! Love this idea!! We don't have a stairs but we have an unusually large hall closet that my husband uses as a tiny office. This would be fun to do in there! I'll have to check out WallsNeedLove! What a cute space - I want a space like that for myself haha! Labeling 101 - Best Label Maker Ever!